To begin with, we punted the Cub Campers Frontier through winding mountain trails and stunning coastal roads to see how it’d handle everything - from high-speed dirt to tight valleys and screaming children; a proper torture test - and it passed with flying colours. The Frontier is one of the lightest campers on the market, even though the spec. sheet would make you think anything but. 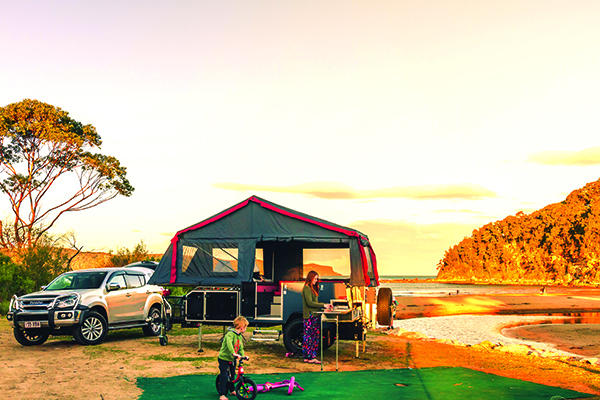 Lightweight campers are great, and there’s plenty of them on the market, but to be the complete package they need to combine light weight with a quick setup time and huge footprint when folded right out. An impossible target, but one the Frontier comes damned close to hitting. Drop the stabiliser legs down. 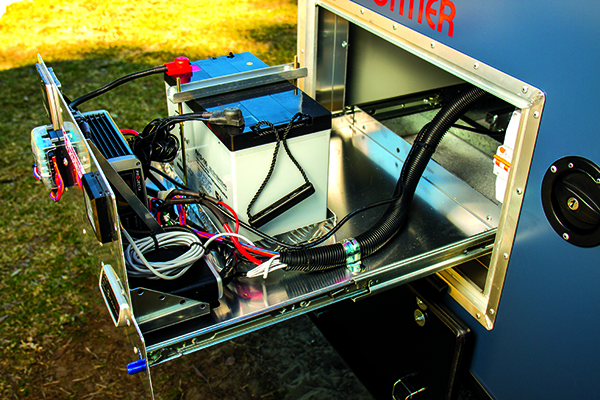 Wind the roof over with the silent winch. That’s it. That’s literally it. The whole process from start to finish can be done in less than a couple of minutes, and the majority of that is taken up by cranking the stabiliser legs down into place. Buy yourself a 12V drill for that and you can set the camper up from scratch and be cooking up a feed faster than you could set-up a swag. If you’re after a laser-guided porta-potty this is where you might get a little disappointed. There’s no spring-loaded TV lurking underneath a seat, and you’ll have to supply your own Wi-Fi connection if your idea of camping includes Netflix, but the Frontier is well equipped where it counts. On the storage front, the Frontier is no slouch either. With an ATM of 1750kg and Tare of 1220kg, you’ve got over half a tonne of storage to play with. Factor in a load of 140kg when the 100L water tank is filled and the twin 20L jerry’s up front are full, and you’re still left with a cool 390kg of crucial camping kit—like 12V microwaves and an espresso machine. It’s affordable, incredibly light-weight with a great warranty, replete with Aussie build quality and comes with a proven record for holding its resale value. The Cub Campers Frontier is priced at $33,990.